The areas where north hallways intersect the Corridor of History feature iconic objects that bridge the galleries and reference changes in time. These items also serve as landmarks for our visitors, providing examples of the time period represented in each gallery. Scan the hallway and select the time period you wish to explore. 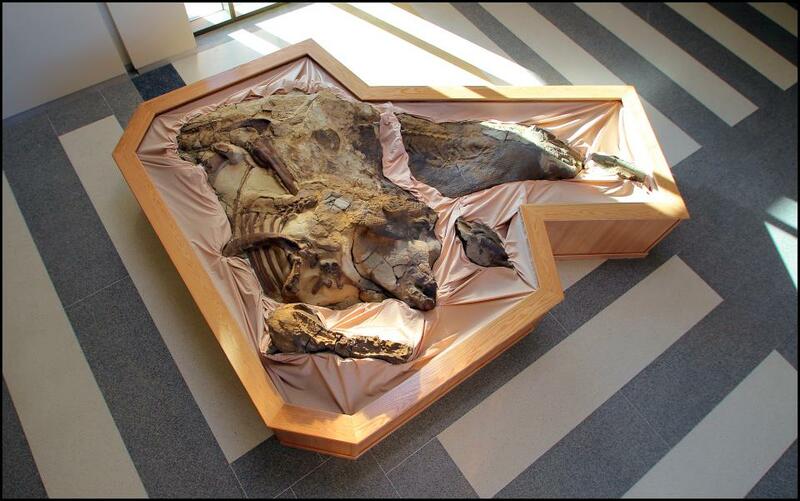 Located at the east end of the Corridor of History, outside the Adaptation Gallery: Geologic Time, is one of the rarest fossils ever found because of its rare skin preservation. This hadrosaur, or duck-billed dinosaur, is nicknamed Dakota. It was discovered in 1999 near Marmarth in southwestern North Dakota. Dakota arrived at the North Dakota Heritage Center in a four-ton body block and smaller tail block in 2006. A major exhibit update scheduled for completion in Feb. 2020 is underway. Learn more about the mummy makeover. The icon bridging the Adaptation Gallery: Geologic Time and the Innovation Gallery: Early Peoples is the mastodon, which lived at the end of the ice age and was hunted by the early inhabitants of North Dakota. The mastodon was one of two elephant-like mammals that lived in North America 10,000 to 20,000 years ago. Adult male mastodons were about 10 feet tall at the shoulder and weighed 8,000 pounds. Like its cousin, the woolly mammoth, mastodons were cold-climate animals covered with a coat of long, shaggy hair. 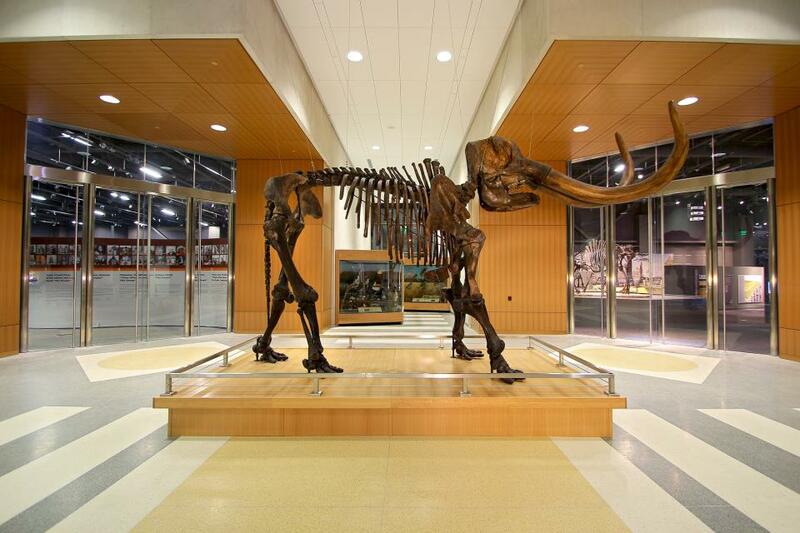 Learn the story of our mastodon. Samuel Holland (1859-1937) was a Norwegian immigrant to Park River, North Dakota. A skilled blacksmith and machinist, he built at least six automobiles between 1898 and 1908. 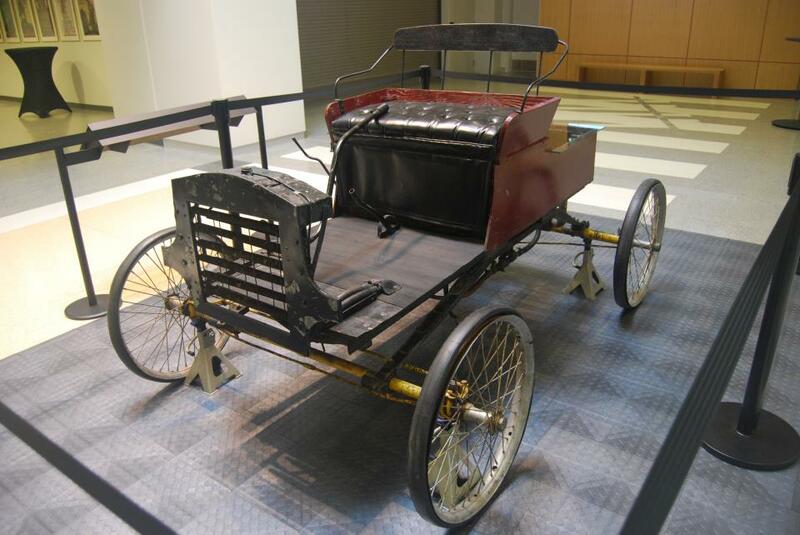 The “Holland Special,” built in 1904, was a low-wheeled runabout that had a 4 hp single-cylinder engine.